It is a nice looking mod. At this point in the game I would not have bought it if only because I know and love the Yihi SX chips. I cant sit through vape videos but did manage to skip through in 10 seconds and landed on one important spot, what he calls fake vaping, I think he said? Its a lot of money in anyone,s estimation !! hi again, any suggestions on a good dual coil rta 26mm for this sl class?? It is a problem i have... i need a rta tha fit perfectly with the diameter of the 510 of my mods or i feel bad! I just ordered a geekvape zeus dual but i think i will be disapointed as the base is 25mm and i did saw a lot of average review on it after buying it. Geekvape Zeus X for me is not only an amazing flavour RTA but it looks REALLY nice on my SL. They are a matched pair for me !! The Manta at least sits on the SX Q fine but this one definetely has overhang, but i was expecting that! Bearing in mind that I have only one one coil and wick so far, I am sure I will improve it by the 2nd or 3rd. 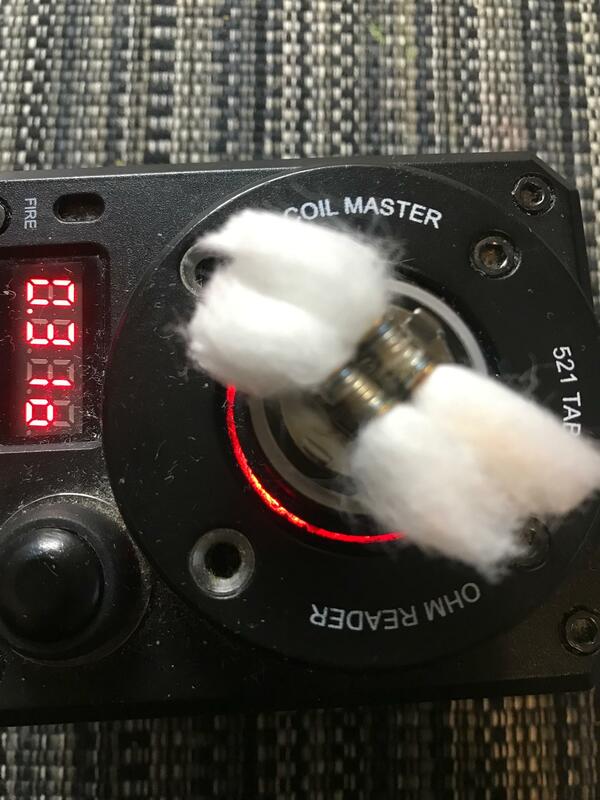 I used 316 @0.30 dual coil, using rayon rather than cotton pads, but per your request Richy, I just did a single strand rather than the coils that were included. The deck is pretty fiddly for single coils but expected that beforehand. 4th/5th hit I receive a bit of juice in my mouth. I am used to pulling harder on a vape than I seem to need here, so when I stop doing that and let it naturally work for me, that goes away. If i compare it to something like the Manta, I just naturally pull harder on it.....but it doesnt seem to need such a hard pull on this one. I have used top air such as the Aeolus Lite and earlier Obus atomizers but the flavour is far better on this then either of those two, despite not being as dense a vape as I normally have preferred, but it isnt necessary on this one. Now 10-11 vapes in and its no longer spitting into my mouth. Guessing that might be simply because i am naturally pulling lighter on it?! 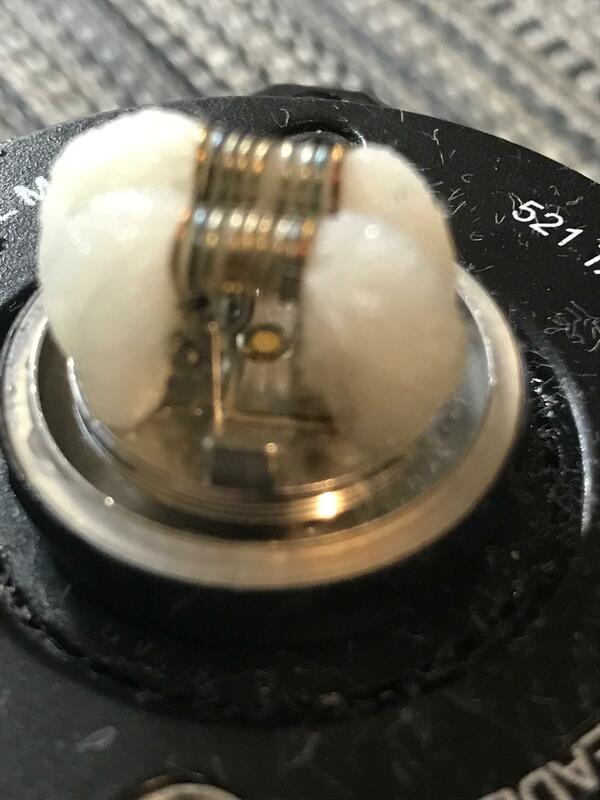 Here are 2 photos as you asked just showing you the coil i used and wick....Sorry, only noticed afterwards they are a bit out of focus but you can get the idea. Its presently on top of the SX Mini ML class so it looks a bit top heavy with a slight bit of overhang. I will decide later this week if I will buy the new SX for it and if so I will likely buy a second Zeus X for back up. Thanks for talking me into this one Richy!!! Were you on horseback when you wrapped those...? What's the worst that could happen...?